Cornmeal, a cooking and baking ingredient, is created by grinding dried corn. Yellow cornmeal is a common variety sold in grocery stores, although you may also find white cornmeal and blue cornmeal. Cornmeal generally has a fine texture. Other varieties, such as whole-grain or stone-ground cornmeal offers a coarser texture. It includes a number of vitamins and minerals and is high in carbohydrates as well. One 3-tablespoon serving of yellow cornmeal contains 110 calories; however, it’s more common to eat cornmeal incorporated into recipes rather than to eat it by itself. The simplest ways to use cornmeal include cornmeal mush and polenta. In both cases, cornmeal mixed with water and salt produces a soft porridge-like dish. Polenta requires the addition of butter, though. Another common use for cornmeal includes spreading it on the bottom of a pizza crust before baking to help avoid sticking while baking. A serving of cornmeal contains 24 grams carbohydrates, or 18.5 percent of the carbs suggested for daily consumption by the Institute of Medicine. The carbohydrates in cornmeal have a variety of uses in your body, including promoting the proper function of your central nervous system and kidneys, and serving as the main supply of energy for your body. One serving of cornmeal also provides you with 2 grams of protein; the IOM recommends 46 to 56 grams of protein per day. Cornmeal serves as a good source of folic acid, a vitamin that helps your body efficiently use protein and works to prevent birth defects. One serving of cornmeal has 10 percent of the recommended daily intake of this vitamin. You will also take in 8 percent of the thiamine you need per serving of cornmeal. Thiamine, also known as vitamin B-1, makes cornmeal a food useful for influencing the health of your nerves. Additionally, a serving of cornmeal provides you with 4 percent riboflavin, niacin and iron you require each day to meet your nutritional goals. Collectively, these nutrients support your metabolism. Iron also aids in red blood cell production, while niacin benefits your cardiovascular system. 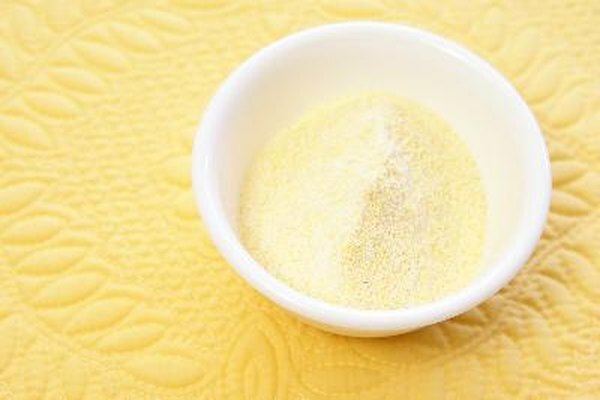 Yellow cornmeal may help protect you against cellular damage caused by free radicals, and this may decrease your risk of macular degeneration, cancer and some forms of heart disease. Research published in a 2008 issue of the “Journal of Agricultural and Food Chemistry” indicates that cornmeal and other processed yellow corn food products contain high levels of antioxidants, including carotenoids, reports Baking Management. These compounds may prevent a variety of diseases, including cancer and heart disease.